Crook County has a new treasurer. Debbie Palmer, who has held a similar position in Jefferson County, was appointed to the position during a County Court meeting Wednesday morning. The appointment was made shortly after the deadline passed to run for the office and Palmer emerged as the only candidate. She will hold the treasurer office by appointment until January, and begin her elected four-year term thereafter. Palmer, who is 57, was born and raised in Stanfield, a small community near Hermiston. After graduating high school in her home town, she studied accounting, and she and her family eventually landed in Madras in 2000. "I worked for Jefferson County for 11-and-a-half years in their finance department," she said. "I was appointed tax collector there in 2010. Then in 2013, we had some issues with our treasurer there, and I was appointed deputy treasurer in 2015. Palmer began a gradual transition to full-time residence of Crook County in 2010, when she and her husband purchased a second home in Powell Butte in 2010. "We maintained two residences for many years, as my husband was the manager at Round Butte Hatchery," she said. Dividing time between the two locations, Palmer moved to Powell Butte exclusively in 2012 after her son and daughter had completed high school in Madras. When her husband retired a little more than a year ago, he joined her full time in Powell Butte. 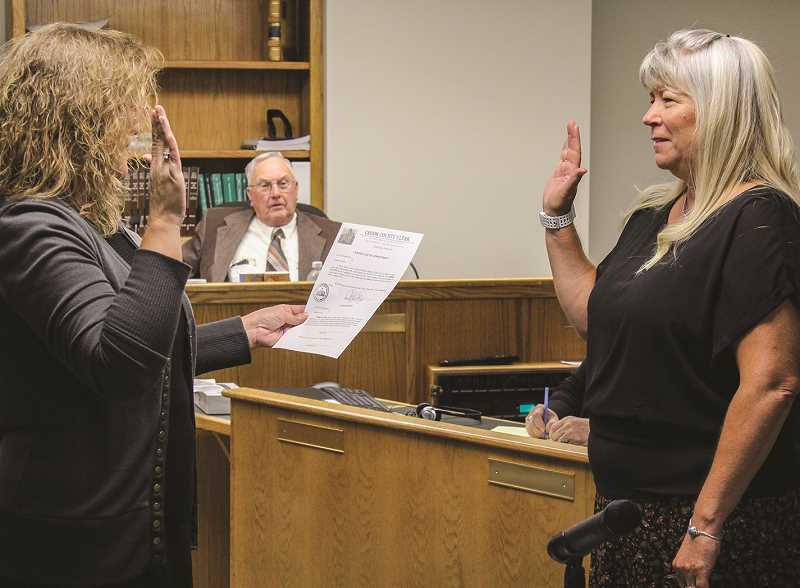 Because she now lives closer to Prineville than Madras, Palmer said she had hoped a position would open in the Crook County Treasurer's Office. "It is a miserable commute in the winter," she said of the daily drives from Powell Butte to Madras. So when former Treasurer Kathy Gray resigned this past May, opening up the position to election this November, Palmer threw her hat in the ring. In the job, see saw work similar to what she did in Madras. "I like what I did in Jefferson County. It was a small county like Crook. I wore many different hats," she said. "It was appealing to me to come to work here. I see a lot of the same opportunities with less commute." Palmer joins the county finance team during a period of transition. When Gray resigned, county leaders had begun plans to restructure the finance office, so Palmer said some of her job duties are still getting sorted out. She noted that the county has recently hired a chief financial officer, and as treasurer, she anticipates working with the new department leader to accomplish some pressing needs. "We are in the process of trying to get the last fiscal year closed. We have audits coming up," she said. "We also have a property tax roll that will be getting certified soon, so we are working to make sure we have got all of that in order."